Over the past few years, the Indian outsourcing market has grown by leaps and bounds with more and more overseas companies outsourcing everything from customer support, to accounting, to animation and even teleradiology. Earlier on, though India has 35 large cities, only a few like Bangalore, Chennai, Delhi and Mumbai ruled the Indian outsourcing industry, as other lacked in skill sets, expertise and manpower resources. Bangalore continues to rule as India’s software hub, with its availability of skilled resources. The pleasant climate of Bangalore has also been a factor in Bangalore’s popularity. This was the place where the Indian outsourcing revolution began and according to recent surveys, it continues to be rated as the top Indian city for investing, living and earning. However, the city’s inadequate infrastructure, constant political bickering, exploding population, poor urban planning and high real estate prices are some factors why other Indian cities are slowly overtaking Bangalore. Almost any outsourcing service, be it software, customer support, chip design, IT consulting, tax processing or Bioinformatics can be handled by the Silicon Valley of India. When compared to other Indian cities, Bangalore employs the most number of IT professionals. The leading companies situated in Bangalore are Infosys, Wipro, Intel, IBM, SAP, SAS, Dell, Tisco, TI, Motorola, HP, Oracle, Yahoo, AOL, E & Y and Accenture. Chennai was not a popular choice for outsourcing like Bangalore or Hyderabad during the early years of outsourcing in India. But today, Chennai has emerged as India’s leading outsourcing hub with advantages such as, low cost of living, better infrastructure, larger space, high connectivity, availability of skilled IT resources and low attrition rates to name a few. This city has the best infrastructure facilities in India. The city of Chennai is taking after Bangalore by specializing in almost every area, including software, animation, ITES, back office, tax processing etc. Cognizant, Standard Chartered, Polaris, EDS and Pentamedia are some of the prominent companies in Chennai. By building up its urban infrastructure and with a supportive government, Hyderabad has continued to attract global investors. The government in Hyderabad has always extended its support to the IT industry and planned a growth phase in the city; to improve infrastructural facilities.The city of Hyderabad is skilled at handling offshore work related to BPO, software, ITES and product design. The famous IT companies in Hyderabad are HSBC, Satyam, Google and Microsoft amongst others. The capital of India is expensive and not a popular outsourcing destination, but its surrounding cities such as Gurgaon and Noida are fast emerging as outsourcing locations, due to their proximity to Delhi, availability of skilled resources and good international linkages. New Delhi, along with Gurgaon and Noida are outsourcing cities that you can consider for call center services, chip designs, transaction processing and software services. GE, American Express, ST Microelectronics, Wipro Spectramind, Convergys, Daksh and ExL are some of the well–known companies situated in these Indian cities. The city of Mumbai has favorable government policies, skilled IT resources and excellent infrastructure facilities making it an ideal outsourcing location. This city is skilled at providing finance and accounting services, application development, software solutions, BPO services and healthcare solutions. TCS, IBM, Mphasis, i–flex, Morgan Stanley, Citigroup Infosys, Wipro, HCL and Mahindra Satyam are some of the leading companies in Mumbai. This city is gaining a lot of attention because of its low costs and large availability of IT resources. However, Kolkata is famous for its frequent trade shut downs and constant traffic congestions. The government of Kolkata has been building up the city’s infrastructural facilities to attract outsourcing investors. 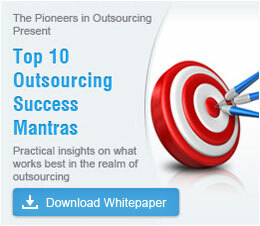 Kolkata will soon emerge as an ideal outsourcing location. Software and other consultation services are the main services offered from this city. PwC, IBM, ITC InfoTech, TCS are the leading companies in Kolkata. Professionals at Pune can handle customer support, embedded software and chip design amongst others. MsourcE, C–DAC, Persistent Systems and Zensar are the prominent companies in Pune. The city of Pune is close to Indian’s financial capital, Mumbai. The large availability of IT professionals has made Pune a rising outsourcing hub. With improving infrastructure and housing facilities, Pune is on its way to becoming a hi–tech outsourcing city. These twin cities are well panned and are developing their infrastructural facilities. Along with ample space, they also have the skilled resources and financial capability, all the right ingredients for an outsourcing destination. Though these Indian cities do not have an international airport, they are well connected by rail and road to Delhi. The city of Mysore is being preferred over India’s Silicon Valley, as Bangalore is getting more expensive and congested, along with a higher attrition rate. With the presence of companies like Wipro and Infosys and the city’s closeness to Bangalore, more overseas companies are planning on investing in Mysore. Though a small city, Mysore is soon to emerge as a leading outsourcing location. This city, located in Kerala is home to acclaimed technology and science research organizations. This city has started gaining outsourcing attention with its budding infrastructure and availability of skilled IT resources. When it comes to engineering services, the city of Coimbatore is the first name that comes to mind, as it is India’s engineering outsourcing hub. This city has a large number of young engineering graduates along with skilled IT resources. The Tamil Nadu government has been taking efforts to develop Coimbatore and promote it as an outsourcing location. Bangalore, is the largest & preferred outsourcing hub with highest number of IT, R&D, electronics & software companies. Favorable government policies, urban infrastructure & quality resources make Mumbai a popular outsourcing destination. Delhi & NCR ranks among the world's top eight global outsourcing destinations, due to presence of skilled resources, robust infrastructure & international airport. A look at some of the big players and their investment plans in the vast, untapped Indian market.